Sibling rivalry is an inevitable challenge of raising more than one child. No matter what the age difference or personalities of the children, sooner or later, every child with siblings gets upset with their brother or sister. But don’t fret and think this is a sign of how it will be forever. The Hand in Hand parenting philosophy is that children are naturally good, loving and want to get along and co-operate with each other. However, sometimes they may get overwhelmed with big feelings of not having enough of you and your time, of not wanting to share, or because of other upsets that may happen in everyday life. When this happens, hurt feelings overwhelm their limbic system – the emotional part of the brain, and when this happens, their pre-frontal cortex – the part of the brain responsible for rational and reasonable thinking can’t function well. This then results in the negative behaviour that we see happen between siblings. Getting regular listening time can help us deal with the feelings that arise in us about our children’s fighting. It can be really helpful to talk about the past, and how our relationship was with our own siblings. As we release our own feelings we can focus on sibling rivalry with a clear head. When siblings have been hurt by each other, or are crying or angry. Staylistening may be the best course of action, simply listening to upsets, until they feel better. At other times when there’s light tension then playlistening is perfect. When we move in close and dissolve sibling power struggles with play, our children will have this powerful outlet to release stress and tension, through laughter and fun. As they let go of their feelings, they won’t need to take them out on each other. Some of these games are ideal for playing in the moment when sibling rivalry arises. Some can be used as preventative. Some of these games centre, on putting yourself as the parent in the less powerful role. As your children conspire against you, and release their feelings, they get to bond and connect. It’s important to remember that these tips are not just for children with siblings! We have successfully used many of these tips for dealing with ‘friend rivalry’ which can also be very common in the early years. 1. My precious object This game is perfect to play when two siblings are fighting over a toy. Pick up a book, cushion, or any object that isn’t really too precious. Tell your children it’s your precious object that you never want to let go of. Hold it really tight then let them wrestle you for it. Repeat with a different object so each child gets a turn grabbing something out of your hands. 2.Runaway Ball Take everyone into the garden or park to run away some tension. Bring a ball, and tell your children in a playfully serious tone that you don’t want it thrown in a particular place – for example down a slide, or into a clump of trees, or that they can play with it but just don’t throw it too each other (a bit of simple reverse psychology often works!). Let them grab it off you and run along. Playfully wrestle them to try and get it back, but always let them win. Manage the play so both children get a turn at grabbing the ball. 3. Hiding An Object You could try this with a ball in the garden as in tip 2, or with another object around the house. Tell your children in a playfully serious way that you really don’t want them to play with this object anymore, and that you are going to hide it so they can’t find it. While you hide it, tell them to close their eyes and not to peek in a way that actually invites them to peek! Then make a big fuss when the object gets discovered, and they start playing with it ‘’Oh no! How did you find it so quickly?’’ Hide two objects if it works better for each child to find one. 4. Music Therapy Have a box full of noisy musical instrument like shakers and recorders. When you are trying to get on with a household chore such as cleaning, or cooking, or writing an e-mail, and you sense a storm is brewing between your children, tell them in a playful and inviting tone, that you really hope they don’t get out the musical instruments and disturb you. My daughter and her friend absolutely loved making a noise fest to “disturb” me while I tried to cook dinner, and it helped them remain connected so they didn’t fight. For added giggles, you can playfully take the instruments off your kids, and put them back in the drawer telling them, that you really hope they don’t get them out again. 5. Silly Challenges From Hand in Hand’s Julianne Idleman. Tell your children that you are the champion at certain challenge, and that you could beat the 2/3/4/ kids together. It could be throwing socks off the bed, or blowing ping pong balls off a table with a straw, any fun challenge that everyone would enjoy. Then they get to compete against you, bonding and releasing tension. Put up a good fight, but let them win in the end, while you act all ‘upset’ and surprised at how they managed to beat you. 7. Commentator on the Scene From Larry Cohen. As a disagreement rises and each child comments (ok, slings insults) at each other, you give action-by-action commentary. As if you are watching a tennis match, you swing your head from side to side saying things like,“Oh, and now he’s flicked something at her, and now she retaliates by pushing the legs of his chair, and I wonder what will happen next?! !” I use this a lot and it is guaranteed to get them giggling! 8. Playful Insults From Otilia Mantelers, Hand in Hand Parenting instructor in Romania. If your children are insulting each other and calling each other ugly or stupid, try to divert the insults towards yourself instead. So if they are calling each other stupid, say ‘’I hope no-one calls me stupid. If anyone calls me stupid, I would be so upset. I would call my mum.’’ Or if they say the other one is ugly, say, ‘’I hope no-one calls me ugly.’’ Get exaggeratedly upset. Put a towel over your head. Tell them that you are going to hide, and you hope no-one take the towel off to reveal your ugly face. 9. Family Meeting From Hand in Hand instructor in Australia Skye Munro. If my precious gems are having a hard moment and are not able to get along I will often put on a silly hat and announce myself as Mayor Munro . I will call an “emergency meeting ” and be a fumbling, bumbling Mayor who falls over a lot and can never find the right thing to take notes with ( I will get a carrot for a pen etc). I will ask each child to “plead their case” and pretend to take notes. After listening to both children I will come up with a ridiculous outcome, for example if they are arguing over a particular toy I will announce “Whomever can stand on one leg with their eyes closed and finger on their left ear the longest shall be the rightful owner of the toy.” Often, by the time we get to this we have giggled away a lot of tension and they are able to play and think well again. You can also try something similar with a ‘super mummy’ or daddy to sort things out. 10. Joining In The Fight From Skye Munro. If my children start arguing, and I feel I need to be involved, I will often try being playful first and join in the fight!! I will talk in an exaggerated whiny voice and be really over the top – aiming for laughter . “No it’s myyyyyy turn on the swing you went first last time . It’s not faiiiiir !! !” I may even add some fake crying in there and call for my Mum!!! They will often start laughing at this and release the tension that was blocking them from being able to negotiate their challenge. 11. Pushing From Hand in Hand instructor Ceci Hyoun. This one is ideal for when a younger child is feeling powerless and struggling to keep up with an older one. Hold out the palm of your hands and tell your child something like, “Come on give me all you’ve got!’’ This lets them know that they can push and shove you. Push back with enough resistance so they feel they get to work through the struggle and show some power, while also giving enough slack to let your child ‘win.’ Let your child push you over, get to laugh and feel triumphant. 13. “Who needs hugs?” This really works as a vigorous snuggle. With a playful look in my eye, I say that the bad feelings need to be hugged out of them. They will either love the chance to get physical with you, like my daughter does, or they take the opportunity to outmanoeuvre me and run! Sometimes this ends up in a good game of chase, and to get the sibling involved, we either come from different sides to try and catch him, or even better, we hold hands and stumble along and try and catch him. Lots of laughter! 15. Pillow Fighting And Listening From Carolina and Isabella Hyoun (aged 9 and 7). Get a pillow and have them punch it, or have them knock you down on the bed. Have the two siblings in a room and the grown up will hold a pillow and they can take turns punching a pillow to get their feelings out. 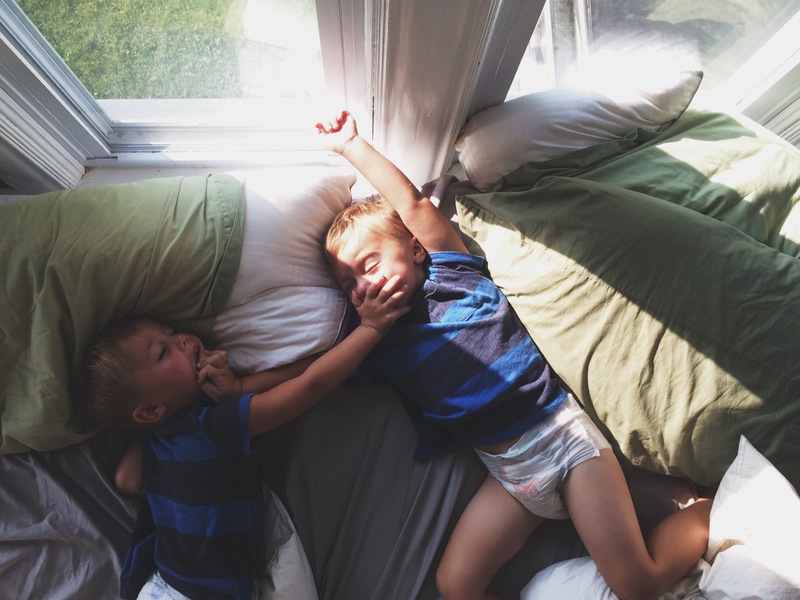 You can also let them use the pillow to try to knock the grown-up down together, so it’s teamwork. Then they’ll realise they can work together rather than against each other. I hope you enjoy dissolving your family tensions with fun and laughter. Do let us know how you get on in the comments, and if you have any playful suggestions of your own we’d love to hear from you! Shaheen Merali is a Hand in Hand instructor in the UK. Mother to a 10 year old boy and an 8 year old girl, she knows first hand the joys and hardships of navigating sibling relations! Connect with Shaheen on Facebook or read more about her journey to Parenting by Connection here. Kate Orson is a Hand in Hand Parenting Instructor, and mother to a 4 year old daughter. Originally from the UK she now lives in Basel, Switzerland. She is the author of Tears Heal, How To Listen To Our Children, which will be published in October, 2016. Connect with Kate on Facebook or follow her blog. Next time I read a blog, Hopefully it doesn’t disappoint me as much as this one. believed you would have something interesting to say. could possibly fix if you weren’t too busy looking for attention.